It's Pub Night: Happy Birthday, Migration! Migration Brewing seems to be humming along with a dedicated clientele. Tomorrow (Saturday, February 19, 2011), they're having a First Anniversary Party starting at 1 PM. Since tomorrow is also Zwickelmania, brewery tours will be part of the program, and they're also excited about a Russian Imperial Stout that they're going to tap for the first time. 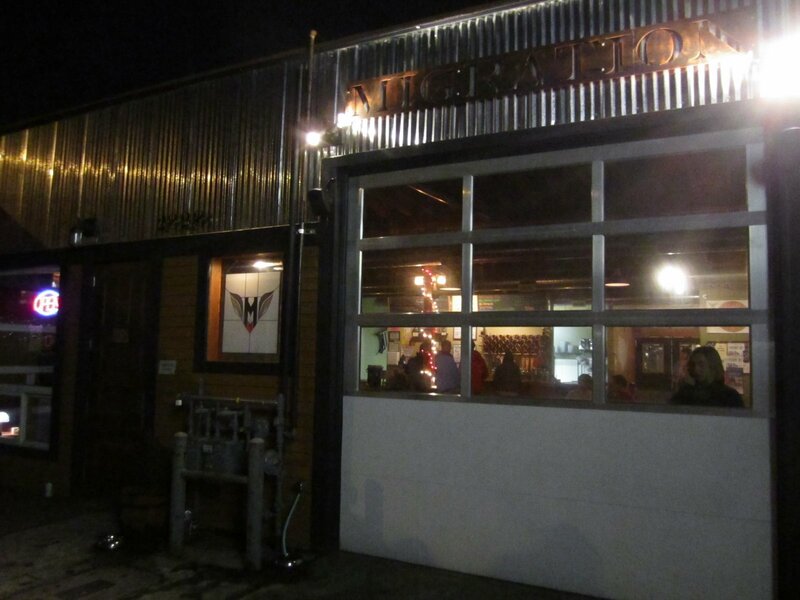 I met some friends at Migration last night -- Joe was getting happy-hour prices until 9 PM because of a "bouldering and brews" deal with nearby rock-climbing gym The Circuit -- and the place was packed. A lot of that was the rock climbers, but it's not uncommon to pass by Migration and see a crowd there, especially when the weather opens up the patio. Peeking into the windows of the other half of the building, it looks like they're putting in a bar and some tables -- I don't know if they already have enough business to expand, or if they're just getting a special party room ready. Migration got off to a rocky start with the beer geeks because of some early quality issues. I haven't been by there much myself -- not because I was boycotting, more because I've been busy (for instance, I haven't spent much time at snob-approved Coalition down the street either). Last night I tried three beers: two of them were hits and one was a miss. The Terry's Porter was roasty, smooth, and rich, and the Migration Pale Ale specially dry-hopped with Cascades was delicious, but the Old Silenus Scottish Ale had that homebrewy taste that put it right on the edge of drain-pour territory. I reckon they're not completely out of the woods on the quality front, but like Meatloaf says, two out of three ain't bad, and they always have four or five nice guest taps as a fallback. Joe and Lisa also had good things to say about the Luscious Lupulin IPA, but the keg had blown before I got a chance to try it. Colin, one of the pub owners, was raving about the forthcoming Imperial Stout, so give it a try if you get the chance. Oops, the Google tells me Migration's is really called "Terry's Porter". I corrected it. Anyway, it was tasty, I thought it had more going on than Hopworks' porter with the similar name.